This Wednesday September 3rd Abby and I will be going on a trip to Washington and Portland. We are going to meet the Moms and their girls that have helped us through this journey the last 2 years. It has been so hard. Especially since the total abandonement by my family outside of my brother who takes my son off my hands and my Auntie and Grandmother who live too far away so see more than a few times a year. We hope to learn so much and to strengthen this bond we have formed. I am so excited to actually meet the women I truly consider my sisters. We will be spending the majority of the week with Gail and Seaira. 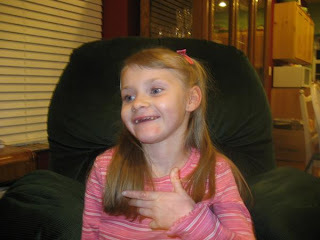 We hope to be able to find time to visit her school and see how they work with a 10 year old with Rett Syndrome. Gail is my rock and often my voice of reason! Tracy and Angel will be flying in on Friday. I love Tracy to death and have always felt like she was my little sis. Jeriemarie and Daphni Jo will be coming to meet with us on Thursday and traveling to Oregon with us. I can't wait to meet these two. Daphni Jo just amazes me and me and Jeriemarie have so much in common in the husband department! While in Oregon we will all be staying with Robyn and Nikyla. We will be doing a Mom and girls slumber party then the tour the next days. I plan on just eating this little one up! So I will spend the next two days packing and repacking and fussing to make sure I HAVE EVERYTHING RIGHT! Hope to talk to and hear from you all soon!!! Hello all. I have been waiting to post a new blog for pictures. 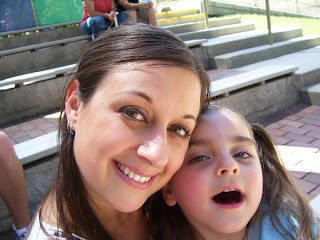 On Saturday the kids and I had a Mom and me day and we went to lunch and the park and shopping. Kyler got some awesome tourist type pics of his sister. He got the most absolutely wonderful pics of his sister getting her 1st haircut at a salon. She laughed and giggled and squealed the whole time they were doing her hair. Yah so too bad when he went to copy them to my computer he hit delete instead of paste! No I didn't kill him. He was freaking out bad enough himself. So unfortunately I don't have all those wonderful pics to share with you. And since I got Abby a pixie cut and her Dad hates it it will be a while before you see and more salon shots. It's really too bad. They were priceless. Dad is convinced he can extract them from the computer but like everything else don't hold your breath. I cannot be responsible for your safety. So this week Abby is going to school for the second week-and lovingit. She gets so excited when the bus comes she can hardly stand. I hate to see the tremors but knowing they are because she is so excited helps. I am still trying to get ready for our Rett Syndrome party in Washington. Still can't believe we are going. I am so excited. I think I'll just add some pics her just so you can enjoy her cute little face. Abby has a little crush on her brothers best friend Blake. Whenever Blake comes over she is just tickled beyond words. Unlike some of Kylers other frinds he always says Hi to her and Goodbye and lets her pat and slobber on him. We have been calling him Abby's boyfriend for weeks.Last night I could hear her giggling from the other room and I went in and I thought she was giggling at ther brother playing guitar hero. When I went back in she had snuggled up to Blake and thought she and he was pretty hot stuff! Abby is back to school! Abby started back to school yesterday and so far is loving it. Her best Buddy from last year has moved on to Kindergarden but Abby has made a new pal already. Abby goes to a special needs preschool and they deal with her very well. I am hoping they ALL finally see that she is in there this year. 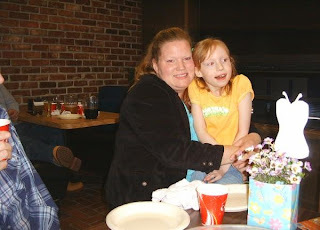 She has a wonderful teacher and aides and therapists. I am going to shool! Oh boy Daddy we're here! Ok Mom they said get out already! Abby stands on her own! After 2 years of working with her Abby stood on her own yesterday. She did it all by herself and I went and grabbed the camera as fast as I could and she did it for me again. She also showed off for her Dad later. We are so excited. It is so hard to put into words when you achieve what may seem like little thngs to families of normal children. Standing on her own from a seated postition is showing great strides in her coordination and muscle control. 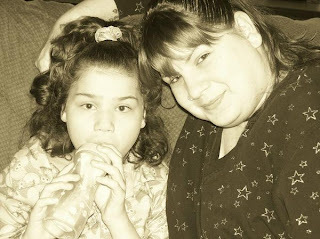 Not something that comes easy to a girl with Rett Syndrome. Hope you enjoy the video! We got Abby's results back from her EEG and everything is normal. Woo Hoo! The tremors are just nervous reactions associated with her condition. We spoke to her doctor about her allergies and since it only seems to be animal dander at this point he is just going to have us give her Claritan to her as needed before we go to someones home or the zoo or if someone is going to visit who has animals. If this isn't enough he will switch her to an everyday med. We had back to school night for Abby last night and of course forgot the camera. Her teacher and therapists were so happy to see her. They all really make us feel like she is the princess of the school. Abby was a little nervous and shakey at first, I think because they had changed the room around and because she hadn't seen her teacher for so long since she was off at the end of the year to have a baby. After a few minutes Abby walked around the room like she owned the place. Her brother took video with his cell phone but I decided not to post it. We weren't able to get any video of her being especially happy and I can't figure out how to cut the 10 minute video down to the good parts. School starts on Monday and I can't wait. Abby had had cabin fever big time and I know she can't wait to get back to her friends and her routine. Abby has terrible allergies to animals. Her brother went to a friends house who had dogs and came home and picked up his sister to cuddle. you have to kind of look at the pic then move your head down to se the rash. These were taken about half an hour after we gave her benadryl. She was covered. Last week we went to my brothers house and he has 2 cats. Within a few minutes she couldn't breath and was covered in hives. I think it's time to go see the allergist. We have a portable Dvd player playing her movies while she bangs away on a cordless non fuctioning keyboard. She is sure she controls what scence plays when. Look Mom Look what I did! Abby had a great weekend. I was afraid after my disaster with The Regional Center that I would be in a bad mood all weekend but she brought me out of it, like she always does. She has her Daddy wrapped and she knows it. This is her snapping her fingers at her Dad. She so owns him. It was 98 degrees,80% himidity and no wind. Chillin with Daddy last night. She has his tshirt on. Oh boy I am angry right now I don't know what all I am going to say. Our Govenor Matt Blunt after stating in his campaign in 2004 that he was opposed to changing Medicaid in Missouri and Services for the disabled cut services to over 400,000 people. After many months of trying to get services for my daughter through the Developmental Regional Center for Persons with Disabilities they finally showed up for our, "care plan" meeting today. I hade all her medical records for them and her sitting right with me. I first handed the lady a booklet on Rett Syndrome and she actually said,"Oh I know what Retts is. It's caused by aspirin. If you take it while you are pregnant or give it to them as an infant." Seriously? That is Reye's Syndrome and it is a liver disorder caused by aspirin. Then she said ,"Ok I see here that Abby is Mentally retarted and has personality disorder. WHAT? Then she started talking about the only funds they had were for Autism children. Well duh. Rett Syndrome is on the spectrum. Thinking they would actually help me I had a list like therapy, respite,diapers,communicater-thanks Kelly, a stroller. Big freaken deal. There are 120 people on the list in our county alone and they serve 11 counties. Then I asked about a medicaid waiver explaining my need to work even from home and my frustration with SSI. This is the kicker. The only time a medicaid waiver becomes available in Missouri is when someone who has one dies! I am at my wits end with the system.